It has been a few months since I have posted. My plan is/was to post more frequently but it has been an exceptionally busy time on many fronts. The exciting news is that we have a new filly and the sadder news is that Little One was kicked out of the herd. Fortunately he has been found and is now being tended to. 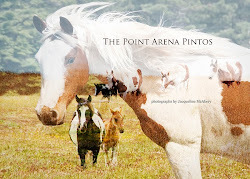 The pintos in general have taken awhile to adjust to spending time over here and prefer to be over at their old home. Fortunately they have a guardian angel in our new neighbor who lets them be over on his land. Periodically I close the gate between the 2 properties so that they can acclimate to being here. 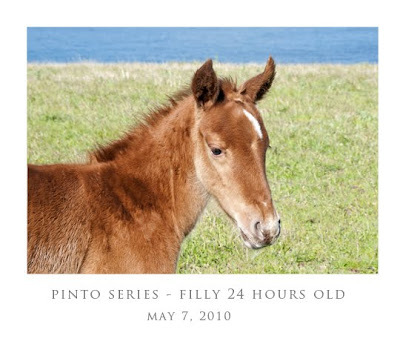 Before the birth of the new filly the wind and the pintos managed to push open the gate and they spent almost 2 weeks at their old home. They finally started coming back here for treats after the filly was stronger. Often we went over to check on everyone and to take photos. 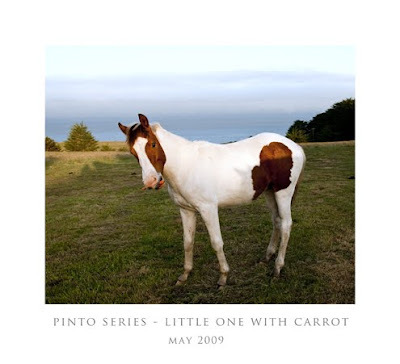 I am working on the pinto calendar for 2011 and a pinto book - many images that were taken during this time will be in them. The horses were here for breakfast today and after they ate they ALL took a nap! 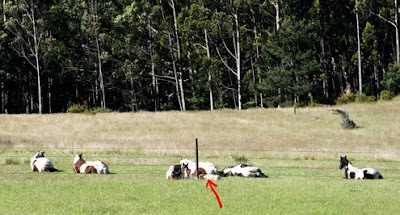 The arrow is pointing at the small filly, . 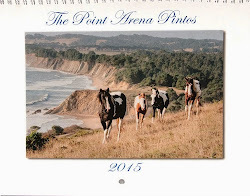 On her left is her Mama, above the filly is Polka Dot and on the left is Thunder. Far right is Suki and far left are Sweetie and Lady. Be sure to see the two new posts below about the new filly and Little One. 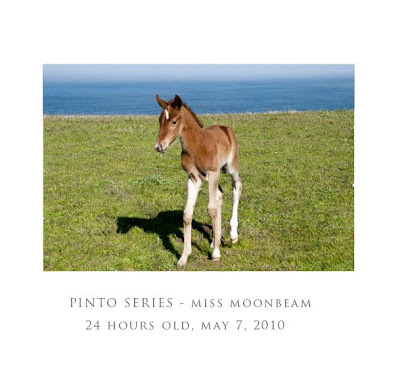 New Filly - Miss Moonbeam! 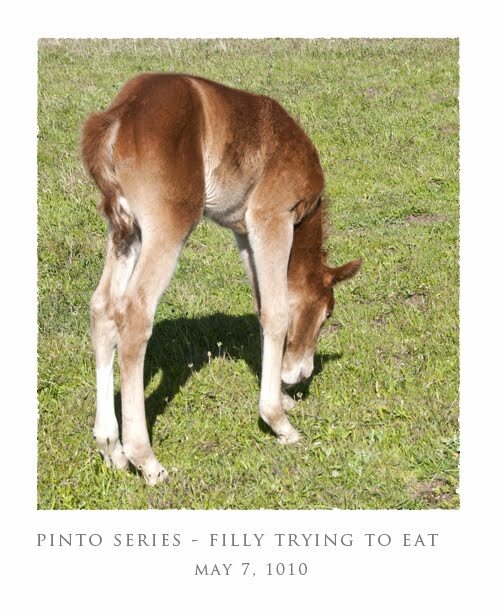 As of May 6th we have a new filly! She was quite a surprise because her mother, Mama (who is also Little One's mother)didn't look very big. I had begun to suspect she might be pregnant, but she has seemed round for the past two years, so it was hard to tell. Another mare, Polka Dot is definitly pregnant and has looked large for many months. 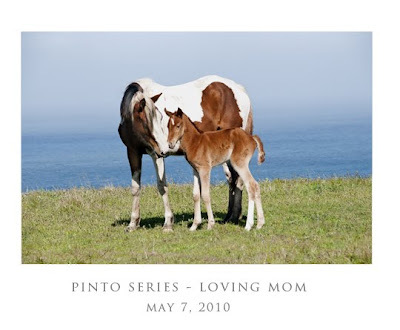 We asked our wonderful neighbor who allows the pintos to roam on his land - their old home - to name her. He came up with the name Moonbeam. She was so small when she was born, she may have even been premature, that I kept thinking of her as miss dainty. So I added Miss to her name and when we need to call her with a shorter name - it is Missy. 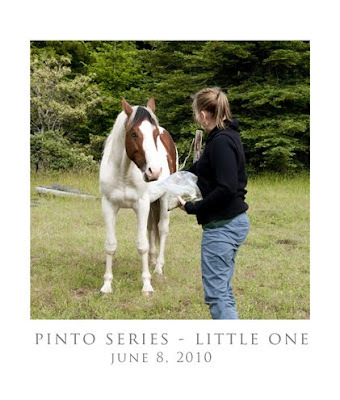 She is a dear and is now a month old and holds her own with the big horses very well...even wants to eat alfalfa squares with them out of the bowl! Instead I just give her a few shavings. She is a little shy with me and sometimes curious, so even though I can touch her she is not quite ready to be touched a lot. This my favorite photograph of her with her Mom- Mama. As you can see she has an unusual white mark on her forehead. When she was just 24 hours old she was so cute trying to eat the grass...her legs were too long and she couldn't quite reach it! Suki was very curious about the new filly and he was always around her the first few days. She is just a few hours old here and Suki made it hard to photograph her alone as he was always with her! I often find Suki, Miss Moonbeam and Mama hanging out together. Little One was kicked out of the herd around April 21st by Thunder during the time of the transition of the fence being built and the horses were acclimating between the 2 properties. We were not sure where he was, but hoped he was hiding in the woods at his old home. It took many searches and several weeks before he would even let us catch a glimpse of him. He has been hiding out in the woods at the other end of the property far away from the rest of the herd. Last week he finally came out of hiding and let us get near him. Since then I have made several trips over there and when I call him, he comes out and will now eat carrots and alfalfa squares from our hands like he use to. Thunder banged him up on both of his sides. The owner of his old home is letting us fix up the old corral there so we can have a vet come and see him in there. He presently eats his treats inside the corral, which will make it easier for him to be comfortable there for vet visit. The above photo was taken of him a year ago during happier times. This photo was taken a few days ago when a friend was feeding him alpha squares. He use to be a bit aggressive and demanding but now he is very submissive. He is very lonely and I am looking into options for getting him back into the herd.